William W. Johnstone was an incredible talent that dabbled in a ton of different types fiction during his 65 years around the sun. From early endeavors in the horror realm to explosive action series' like 'Out of the Ashes' his writing style simply never let up. He loved to write and his passion and enthusiasm poured out on each and every page. Johnstone passed away in 2004 but his legacy lives on, not only through the books he left us but also through his son J.A. Johnstone. J.A. has continued and completed books that his father started and initiated a lot of his own series' based on characters or ideas that may or may not have originated with his father. One of Johnstone's enduring legacies is the Jensen family. This lengthy and all-consuming mythology of Johnstone books (both William and J.A. contribute) began in 1984 with this first book, "The Last Mountain Man", published by Zebra books. The book introduces us to two characters that will remain a part of the Johnstone collaboration for over 30 years and still continues growing to this day - Preacher and Smoke. The debut book begins with young Smoke Jensen working on the family farm in Missouri. Conditions are abysmally bad at this point in the 1800s, just after the end of the Civil War. Smoke's mother has passed away from illness, his brother has been killed in the war and his father Emmett is just coming home from years of fighting the Union. After a quick reunion, the two decide to just start over and leave the farm. Emmett wants the two of them to push westward into the mountains. Unfortunately, neither of them really know about the wilds and dangers of pushing that far west in the 1800s. The two try going into Idaho and quickly find they probably don't have the skills and preparation for living in the wild. Thankfully, an old mountain man named Preacher finds them in the mountains and begins a close-knit relationship with young Smoke Jensen. They all find themselves in a tangle with Native Americans and Smoke quickly reaches manhood by shooting some warriors with an old Navy Colt. Preacher is impressed with the man and senses that Smoke's father may have a different reason for heading west. Preacher promises to teach Smoke how to live off the land and fight for a living in the high mountains. After some skirmishes Emmett confesses to Preacher that there is another agenda for the push west. After the war Smoke's brother was killed by Union soldiers in an attempt to steal Confederate money. They had planned on taking the money and heading west and had killed the Jensen boy and shot Emmett in a firefight. Smoke's father was dying but wanted to ride on and kill the outlaws and get back some of the stolen money. Preacher promises to raise Smoke as Emmett rides off to fight the outlaws. Preacher spends a winter teaching Smoke how to draw fast, fight with his feet and hands and how to survive in the forest hunting and trapping. The character Preacher is extremely funny and Johnstone presents him in a warmhearted way. In true pulp western style, Emmett is killed and Smoke needs revenge. After Emmett is buried both Smoke and Preacher head into the towns of the west to hunt the outlaws. This culminates in a firefight in a place called Canon City with tons of Henrys and Colt .44s. After cleaning up the town Smoke is still left with a decision - pursue the remaining outlaws or just go and lay low for a while. He chooses to head back into Idaho and settle there with his newfound love Nicole. The two live on the ranch and give birth to a baby son named Arthur. In a shock and awe ending, Johnstone promises that Smoke will never be able to rest with a graphic finale. It paints a gritty, horrific scene that will catapult the future of the series into the revenge mold - at least for the first few books. Personally, I felt Johnstone rushed the ending a bit but this closes a very busy and exciting first chapter in a series that will last for years. 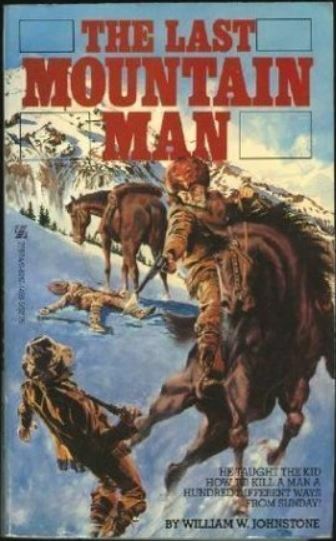 Preacher turns out to be a popular character, so Johnstone decided to tell his origin and how he came to be a mountain man in his own series aptly named 'The First Mountain Man' or sometimes just 'Preacher'.